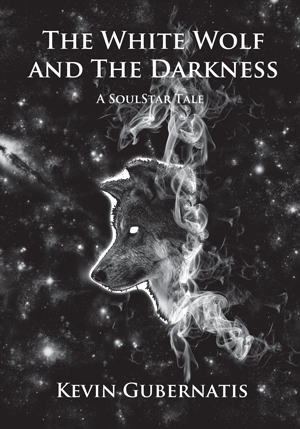 Hello my name is Kevin Gubernatis and welcome to the Soul Star Galaxy, the home universe of my first novel, The White Wolf and the Darkness, which released a year ago on December 1, 2013. I want to first thank you for your interest — I hope you are as excited to read The White Wolf and the Darkness as I am to bring it to you. I live with my creative wife and our neurotic cat in St. Joseph, Missouri. I’ve been writing, well….writing is a strong word. I’ve been making up stories and telling stories since I was a small child. I’d occasionally put some of what I came up with to ink and paper, but usually I would just tell someone about a story I’d made up, to which they would always reply, “You should really write that down.” I finally listened, and here we are. My inspirations for writing are varied and many — much-loved authors include R. A. Salvatore, George R.R. Martin, Sir Arthur Conan Doyle, Elizabeth Boyer, Ransom Prestridge and TJ Rourke — but I’m generally a big nerd. 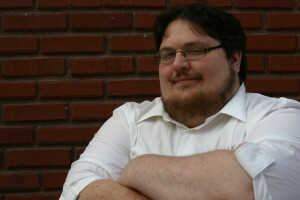 I like fantasy and sci-fi, and am an avid gamer. Some of my favorite games include The Elder Scrolls Series (a constant source of inspiration), Dungeons & Dragons (my wife is my DM), The Mass Effect Trilogy (and pretty much anything from Bioware) and Fallout’s extensive alternate universe. I often use the character creation elements of some of these games to help me determine what a character in something I am writing will look like. Immersing myself in the nuanced and beautiful universes of other sci-fi giants has helped me think about our world since I can remember. My favorite Trek series is Deep Space Nine and I have watched the original Star Wars Trilogy more times than could be counted. I feel that watching the Firefly series in its entirety once a year is good for one’s soul and I was wearing brown coats LONG before they were cool (I was 12). I love the Justice League animated series and the voice of Kevin Conroy as Batman is the voice inside my mind when I am having an inner struggle with conscience. I am a paranormal researcher and enthusiast and tend to love watching most shows about the paranormal, including The Dead Files and Haunted Collector. My two favorite pastimes are eating and talking, preferably together and with people I enjoy, though not technically at the same time (that gets messy). I sincerely hope you enjoy both my book and this site which will be a repository and constant source of information for all the things we have in common, and all things Soul Star. Please feel free to share your thoughts and opinions in the comments, to share links and love for the Soul Star Galaxy in your own universe of friends and family, and to share your copy of The White Wolf and the Darkness, whether you’re dog-earing the pages or borrowing your best friend’s copy on your e-reader. May the luck of the Seven Pillars of Gulu be with you at all times and have a wonderful day. Say Hello! What would you like me to know about you?